May, 2018 – OE solutions for the Aftermarket: As a demonstration of how the market is shifting to include new products developed to tackle the technical challenges of ever-changing engine design, original equipment (OE) manufacturer and system supplier, Dayco, has introduced several new references into its aftermarket programme, including the auxiliary belt tensioner and water pump friction wheel drive for the PRINCE BMW PSA engine utilised in the most common vehicle models such as Mini Cooper S, BMW 1-3 series, Citroen C3-C4, PSA 208-3008. One of the most interesting characteristics of this power plant, is the system that controls the water pump, which is activated only when the temperature of the engine needs to be controlled. Dayco designed, developed and manufactures for OE fitment, both the unique single-arm torsion bar tensioner, which replaces the traditional spiral spring tensioner on the auxiliary drive system and the motorised ‘switchable’ friction pulley that actuates the water pump. At start-up, or whenever the engine is operating below its optimal temperature, the water pump is disengaged, which decreases the engine’s warm up time, reduces its overall emissions and improves fuel consumption. However, once the engine reaches a predetermined temperature, the friction wheel is activated, and the water pump engaged, therefore allowing the engine to optimise its thermal management. 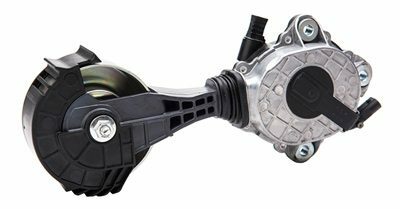 Both the friction wheel, belt and tensioner, along with the water pump and its pulley, are all now part of Dayco’s aftermarket programme, which allows independent workshops the ability to offer their customers a like-for-like replacement that provides them with an alternative to the franchised dealer. Naturally Dayco also offers the replacement auxiliary belt, plus a wide range of parts and kits for this popular engine.